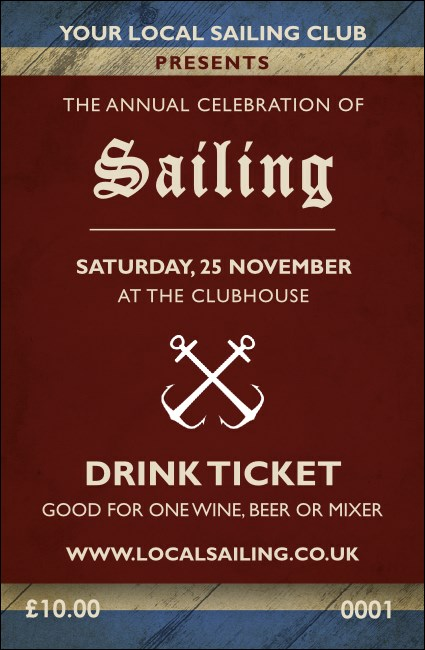 Raise a glass and toast "May your departures equal your landfalls" with the Sailing Drink Ticket. Framed with a nautical blue, this ticket features deep red tones with bold white text, and two anchors holding it down. Celebrate your seafaring race, fundraiser, or celebration with this naval design. Need more nautical-themed materials? Make it a match with a Sailing Event Kit at UK Ticket Printing.